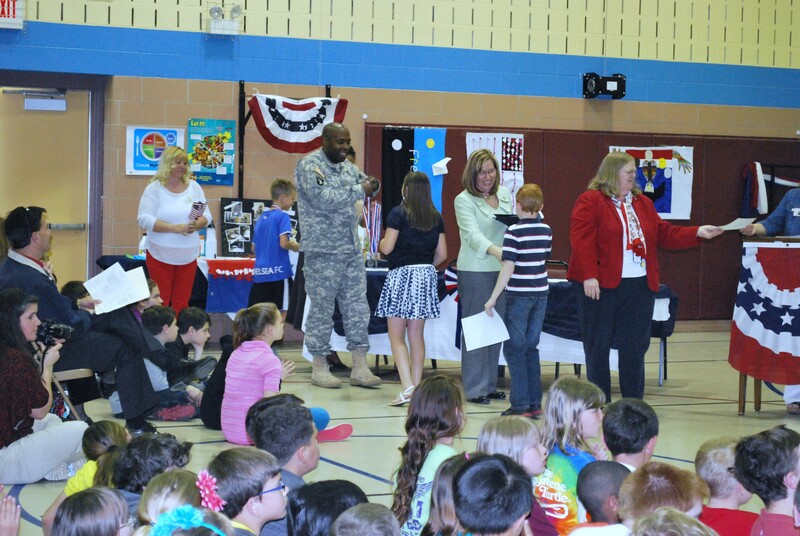 The U.S. Army Research Laboratory participated in Churchville Elementary School's annual Patriot Day program held April 25. 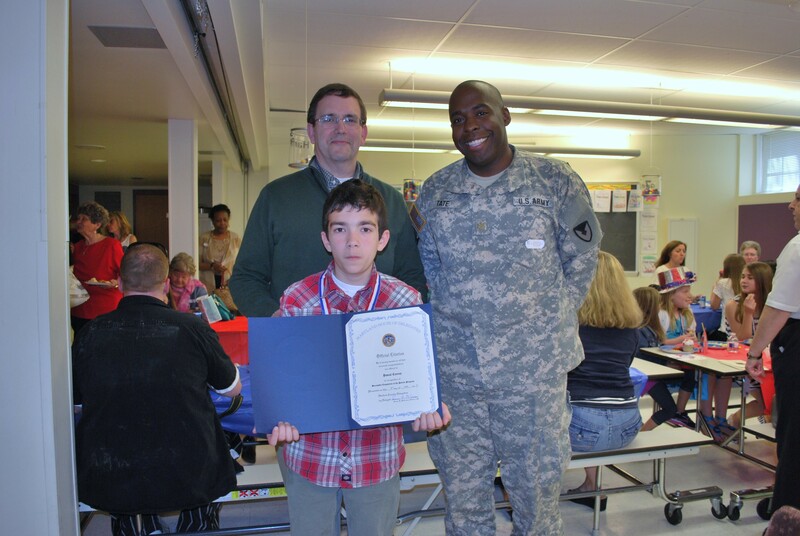 Fifty-two fifth grade students received certificates and awards from state and local politicians and were presented individualized medals by ARL's Maj. Jason Tate from the Weapons and Materials Research Directorate. The program required that youth know State of Maryland facts and its officials, U.S. flag etiquette, the geography of Maryland, and give a report about a patriot or president; participate in community service and speak about their experiences. The students also created a model of a historic place or event, created a U.S. flag design and had to know all 50 states. One of the students, Jessica Youssef, recited the entire Gettysburg Address by memory. She was the only student to achieve this tremendous accomplishment. Col. Richard Schueneman, chief of staff, U.S. Army 20th Support Command, was guest speaker at the event. He provided brief remarks and then entertained the children with a question and answer session, helping them learn more about patriotism and what it means to the community. Paul Conroy, WMRD, is actively involved at the school. Not only did he participate in the school's Read Across America Day earlier this year by reading the Declaration of Independence to the fifth grade students, he also is very active in his son's education at the school. "Public education in America was instituted not only for intellectual growth but to inform the people of who we are and what we stand for as a nation. It has been said that an educated people are a free people. Our freedom must be personally seized and cherished by each successive generation. If not, then we are but one generation from a quite different form of government," said Conroy. "The patriot program in Maryland provides students with a basic knowledge of our country's heritage and a belief and trust in our Democratic Republic form of government created by our forefathers. It instills values and knowledge that will serve the students well throughout their lives." Conroy's son, Pascal, shares his thoughts on what the patriot program means to him. "The patriot program to me is a way for kids like me to understand what their country is all about; duty, sacrifice and service. It's important for kids to learn more about their country, community and government," said Pascal. He said that he was told by a teacher that in the early 1800s a Frenchman visited America and said that it was possible to ask a random pioneer in the frontier about America's government, who was able then to identify who the president was, the three branches of the government, and the type of government that was being used. "The patriot program is all about learning the stuff that the pioneer guy knew hundreds of years ago, it's for understanding the society we live in so we don't get forget our rights and get shammed by some guy on the street," concluded Pascal. Following the formal ceremony, the patriots, parents and guests were invited to a reception in the school cafeteria where they could mingle with the distinguished guests.